Produce professional projects easily with the Lexmark X4975 wireless 3-in-1. One-touch, 2-sided printing, a 25-page automatic document feeder for easy copying and fast print speeds all bring business-class performance to your office! 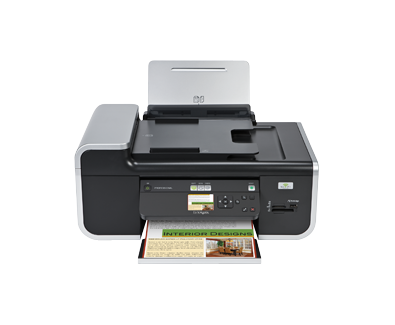 (6) Compared to one standard black cartridge and one standard colour cartridge for this printer. Easily copy and scan multi-page documents with 25-page automatic document feeder. (4) Connected to active PC, Purchase USB Flash drive separately. (2) Printer designed to utilize your network's security (WEP, WPA and WPA2). Subject to the range of your wireless router and access to electricity. (1) Printing in draft mode and excludes time to first page feed. Visit www.lexmark.com for details. A4, L, レター, 2L, 4" x 6", B5, 13 x 18 cm, Legal, A6, 葉書, 10 x 15 cm, A5, 5" x 7"